12 Days of Giveaways- Day 2 Newman’s Own Organics Chocolate | Cook. Vegan. Lover. 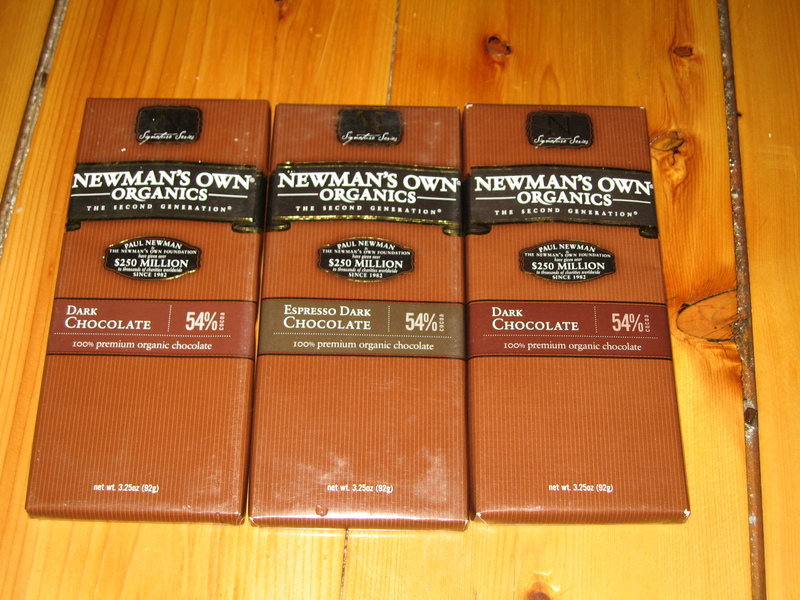 Day 2 of “12 Days of Giveaways” is Newman’s Own Organics Chocolates. There will be three lucky winners of these yummy chocolate bars. So leave a comment by 8am December 4, 2009 for your chance to win. I will choose 3 random winners. This entry was posted in giveaway and tagged 12 days of giveaways, chocolate, giveaway. Bookmark the permalink. Ooh me! Pick me for chocolate! they sent me a HUGE loot like that too — 3 boxes worth of food — I was giving it away right and left. Wow, what a delicious stash! Would love to win! oh boy… talk about delicious! He makes cookies now too? Yum! I’m clearly not getting enough chocolate these days! I love love newman’s o, i’m not always one for sweets but who can deny themselves these?? Hooray for Newman O’s and Chocolate Bars. My dog even eats Newman’s dog food. looks good haven’t tried those yet! YUMMM… I’ve been Vegan for 2 1/2 wks… LUV it! Thx for the great giveaway. Happy Holidays! Whoa, I’m all about the chocolate bars, but I’m more interested in those things on the right: What are Hermits?! My local co-op doesn’t carry those. Or the Newman’s Soy Crisps. Hmm. I think they need a talkin’ to. This loot looks fabbity! I doubt the giveaway is available to UK bloggers but if it is???? Pick me! I have always wanted to try those after seeing them in the blogosphere! Yum yum yum! I almost feel selfish entering for this giveaway since I one the last one, BUT I just can’t say no to chocolate!! you can enter for all the giveaways! don’t feel selfish! Oh my gosh, does that middle one say ESPRESSO chocolate? o.o Because I love all things chocolate and coffee. I would truly love to win this one! I have never had vegan chocolate before, so this would be so fantstic to actually have chocolate! I haven’t had it in years! Espresso dark chocolate sounds pretty darn awesome! Well, chocolate?? Who doesn’t love chocolate?! 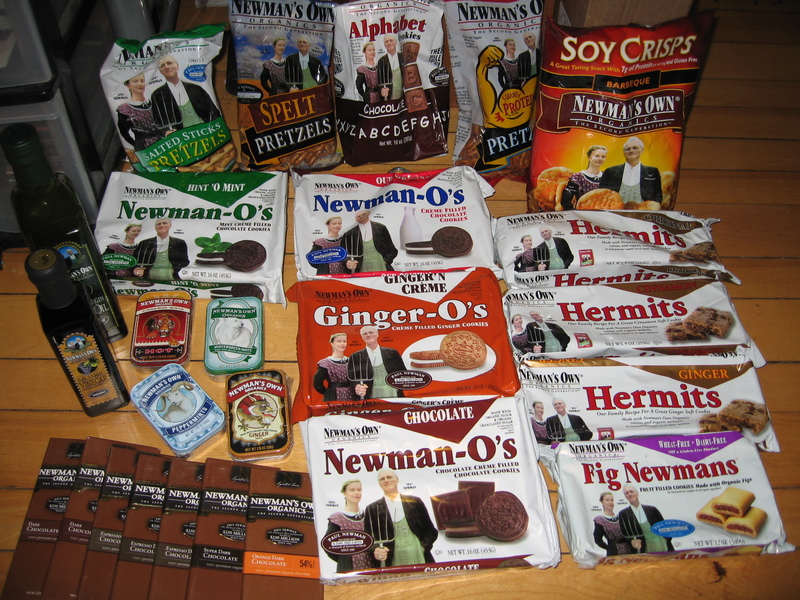 And I’ve been dying to try Newman’s Own products that we can’t get up here. I can’t believe I’ve never tried any of those… in fact, I don’t even think I’ve seen them before! These Chocolate bars are great, almost as good as the Newman o’s!!! wow! that espresso dark chocolate one has my name ALL over it! I’ve never seen these before. Would love to try them! Want! LOVE espresso and dark chocolate. Yum! hi lovey! i miss you. i bet that chocolate is delish. my mom sent me some lake champlain chocolates for my birthday last week… boy do i love the taste of home! cant wait for you to post some yummy recipes on here, cold weather makes me want to cook. This chocolate will go to good use. Mmm, chocolate (I may just have drooled a bit, lol). Yes, please!! Chocolate is one of the food groups. I’d love me some Newman’s! It’s never too late for chocolate right?! ?